The Dilettante’s curiosity constantly diverts him from his intended path. Such was the case a couple of Sundays ago, as I was returning from Newport. It was a grayish day, with more than a hint of late fall, but as I reached Fairfield, Maine, the sun broke through, and I decided to veer off I-95 and head up to see the South Solon Meeting House, a place I’d known about for 45 years, and had always wanted to see, and on this day I decided the time had come. To get to South Solon takes some perseverance. One drives up 120 to Skowhegan, and then up Lakewood Avenue and out of town, on the path for Canada. The convenience stores and car lots of outer Skowhegan rapidly give way to open country—-hardscrabble farmland, fewer houses, more forests. It’s a wilder, poorer, remoter Maine than the one on the south, coastal, side of Interstate 95. As I approached Solon, I kept watching for some sign that I was there—I knew I was south of Solon village proper, and logic dictated that I must be in South Solon now, but nothing, almost literally nothing, was to be seen to give a clue. 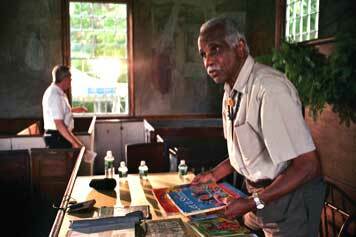 The next day was the opening of hunting season, a serious event in this part of Maine, and in the village, I stopped to ask how to find South Solon and the meeting house, at a convenience store with a huge banner welcoming the hunters who would be arriving tomorrow. The nice guy at the convenience store directed me a mile back down the road, turn at the Quonset hut, and go about two miles. He said the road would get ‘wicked curvy’, and he did not lie. It also went relentlessly uphill in its winding way, and after passing a certain elevation, I found myself driving on the first snow covered ground of the season, evergreens and stone walls frosted with fresh snow. At the crossroads, where once a little village had prospered, there now remained only a couple of old farmhouses, and the object of my quest, the 1842 meeting house. 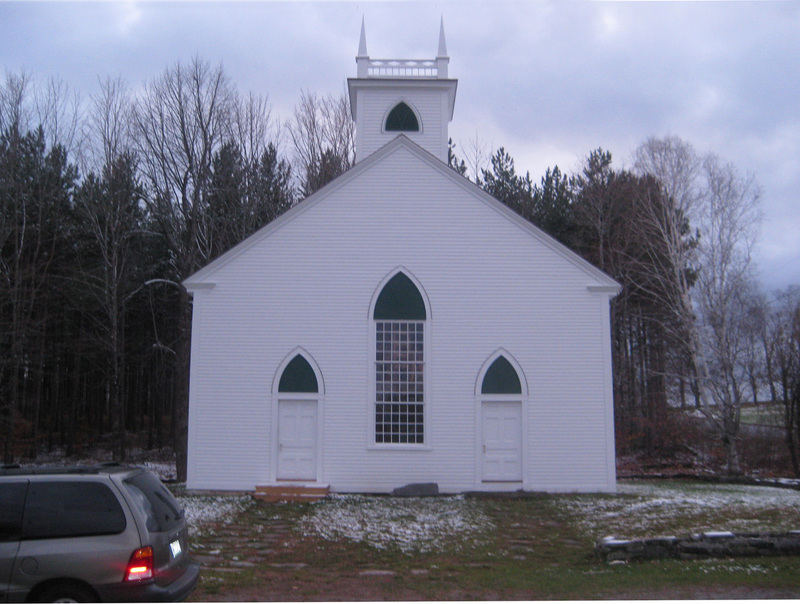 It sat on its corner, a spartan little early clapboard structure in the odd mix of Gothic and Greek revivals that is often seen in New England Churches. 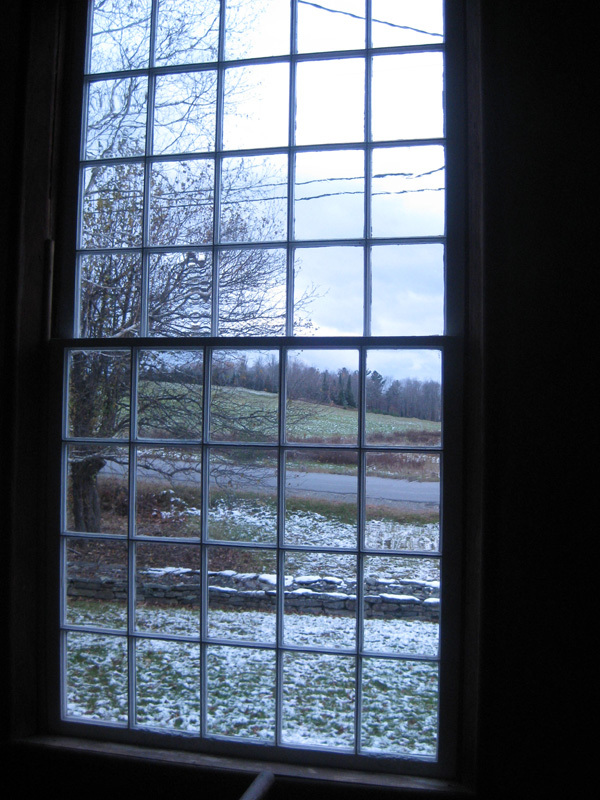 The sun had disappeared again, and I went inside, to view the wonder of South Solon Maine. 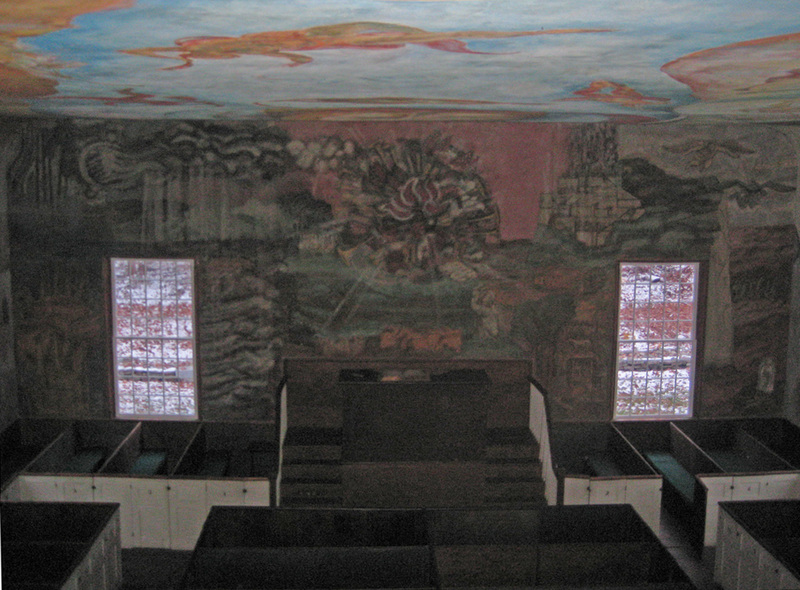 The South Solon Meeting house interior has been barely altered since construction, with only original coats of paint on what few surfaces ever were painted. 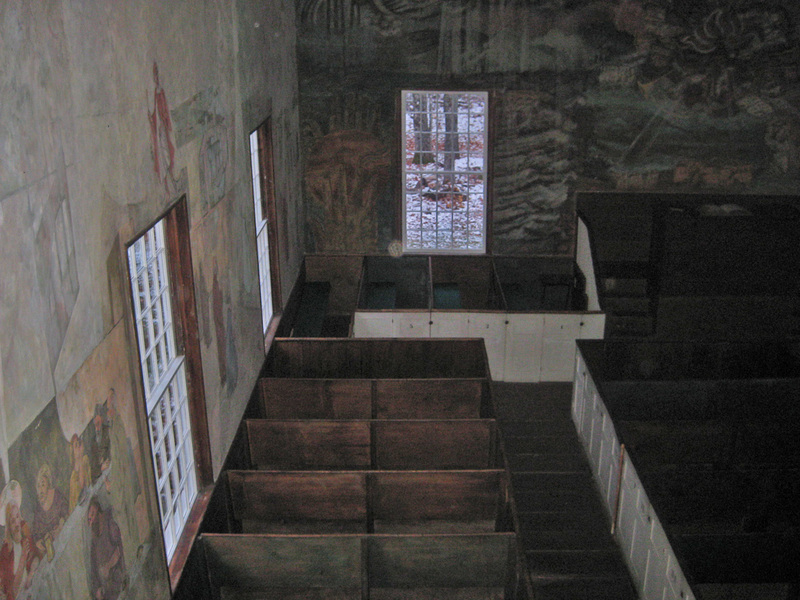 The interior is almost primitive, with the box pews of an earlier age, and the high pulpit reached by double staircase, from which each Sunday the parson would endeavor to save his flock from eternal damnation. Ah, but are you still with me? As charming as I find all of this, it alone would not be enough to take me so far out of my way late on a chilly afternoon. 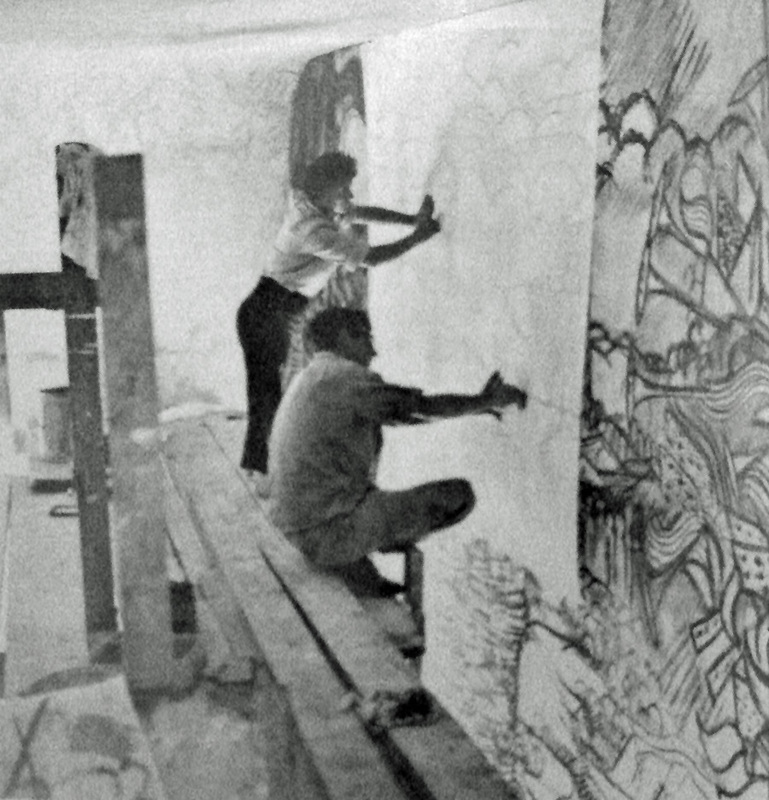 No, the real astonishments of this isolated structure are a series of frescoes covering the walls and ceilings of the entire interior, executed in the 1950’s by students at the Skowhegan School of Painting & Sculpture. The Sistine Chapel it isn’t, and in fact, the overall effect is somewhat odd, but the murals, and the story of how they came to be, is fascinating. 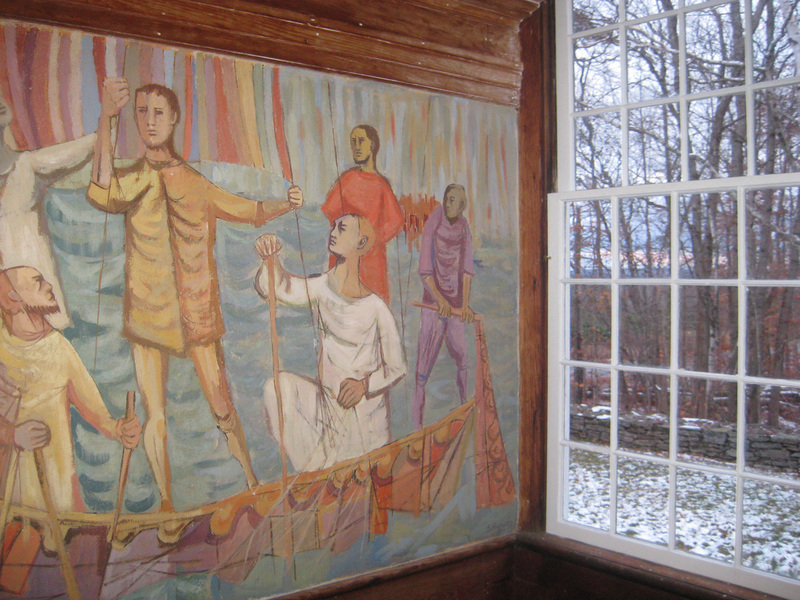 The Skowhegan School was founded in 1946, concurrent with the rise of the New York School, by portraitist Willard Cummings, muralist Henry Varnum Poor, stone sculptor Charles Cutler, and Sidney Simon. 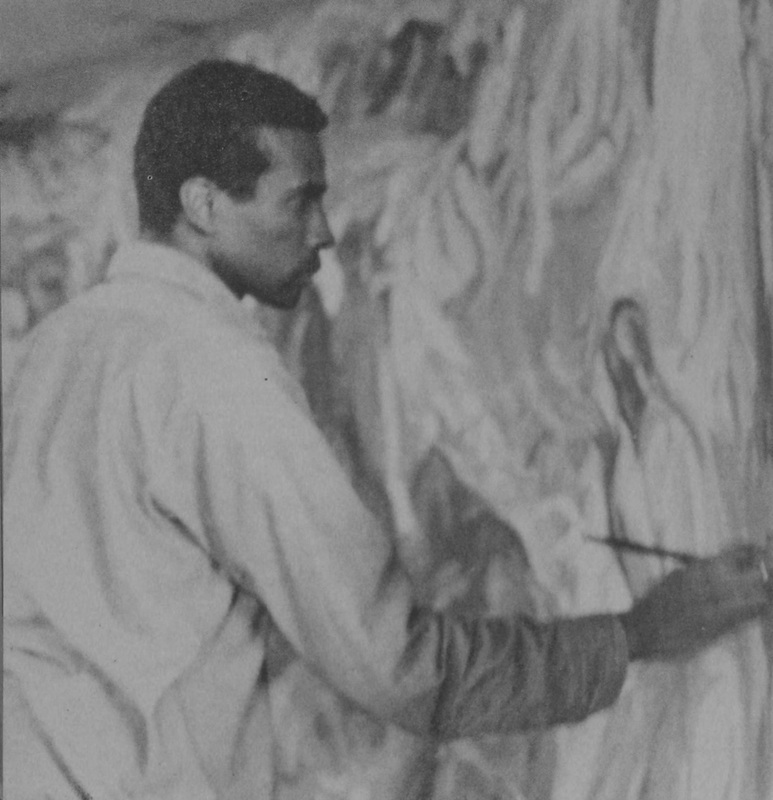 It was, and remains, an art school governed by artists, and has been an influential presence in the American art scene since its inception. 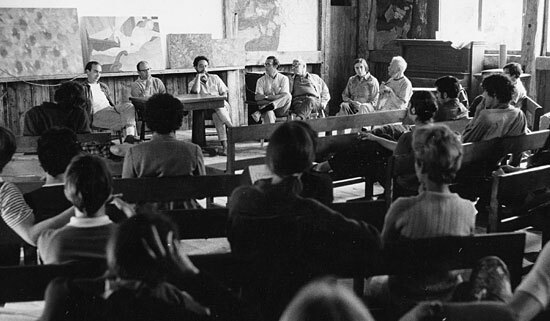 In 1951, Margaret Blake, a trustee of the Chicago Art Institute, who had been visiting the Skowhegan School, was driving on the back roads and came upon the Meeting House. 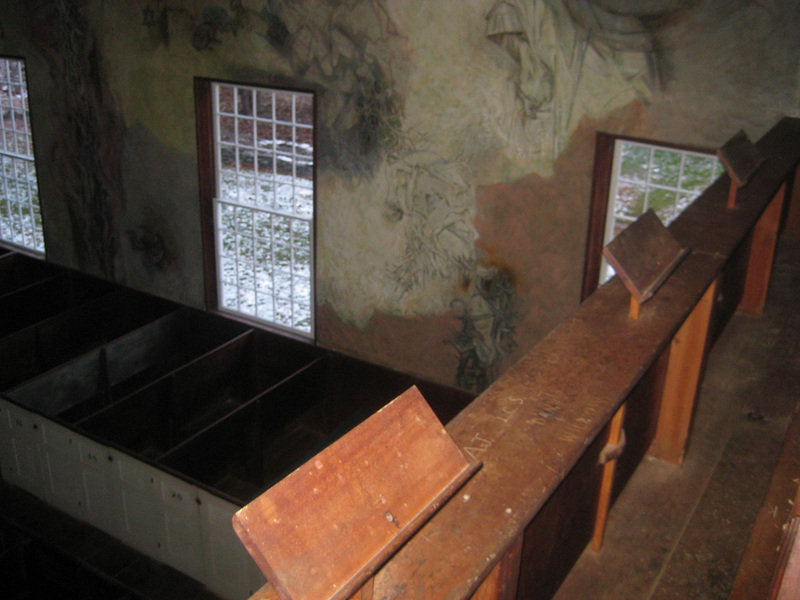 Moved by its shabby, untoched interior, she had the idea of a cooperative art project between the school and the church. 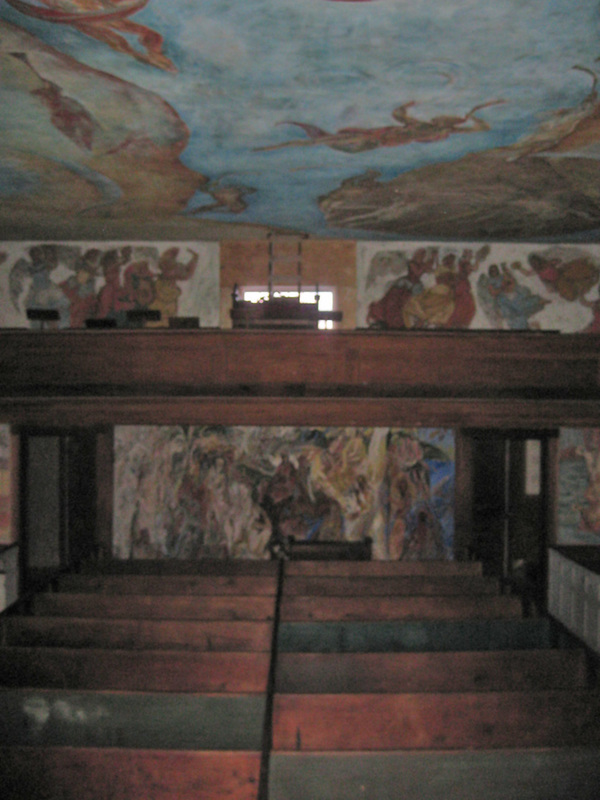 Working with the school, Mrs. Blake set up the ‘Margaret Blake Fellowships For Decoration in True Fresco of the South Solon Meeting House’. A further statement was made that while there were to be no limitations in subject matter, the religious character of the non-sectarian building should be considered, and should have meaning for those whose worshipped there. A national competition was held, and 11 artists were chosen. 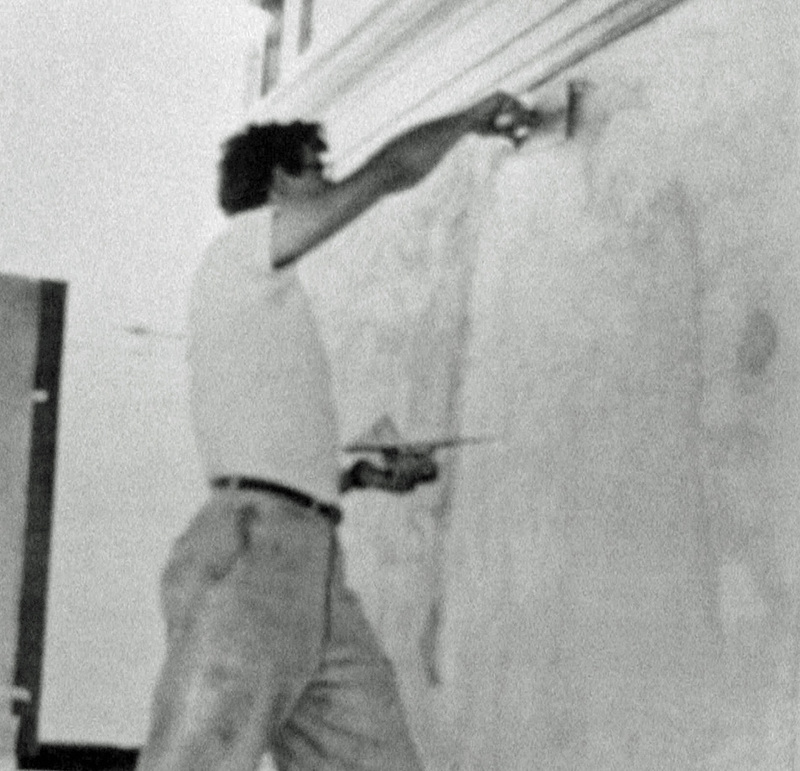 The work was completed five years later, in 1956. 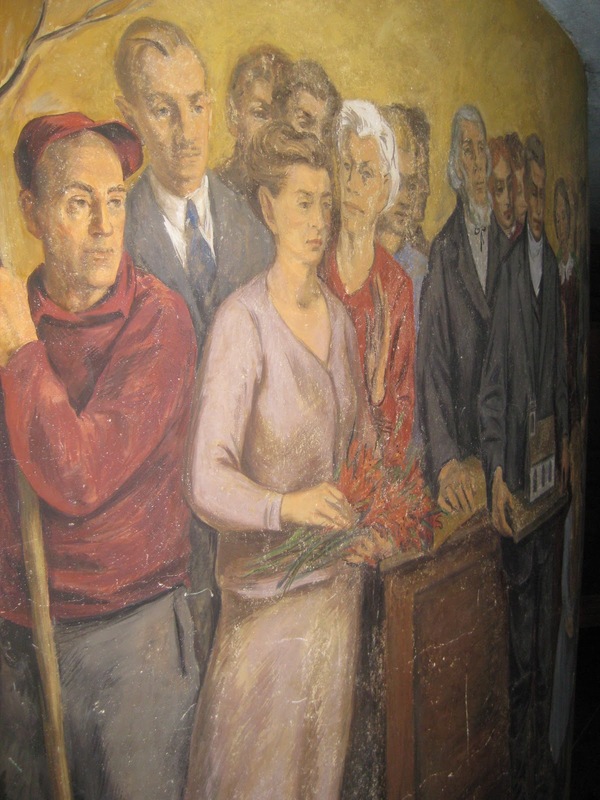 One of Sidney Hurwitz’s frescoes, flanking the Bryan mural. 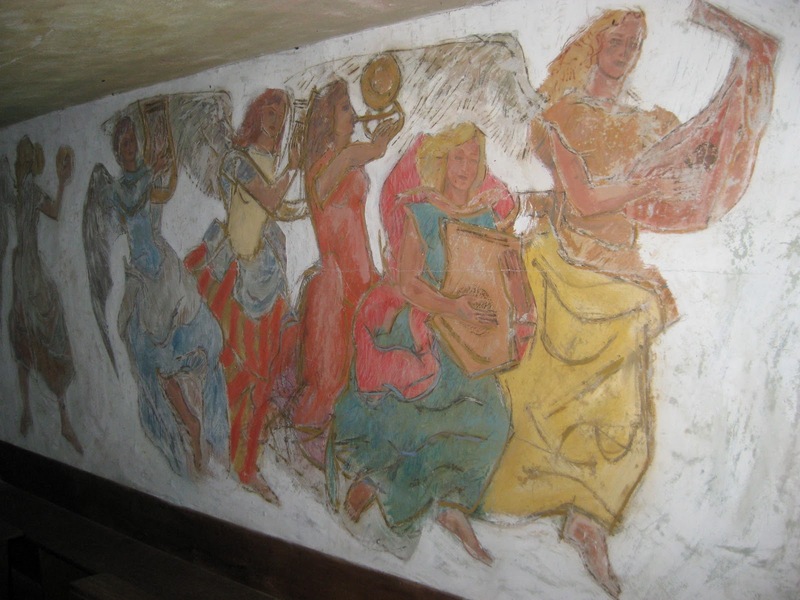 In recent years, with the help of grants, considerable funds have been expended on the conservation of the frescoes, now in the care of the South Solon Historical Society. 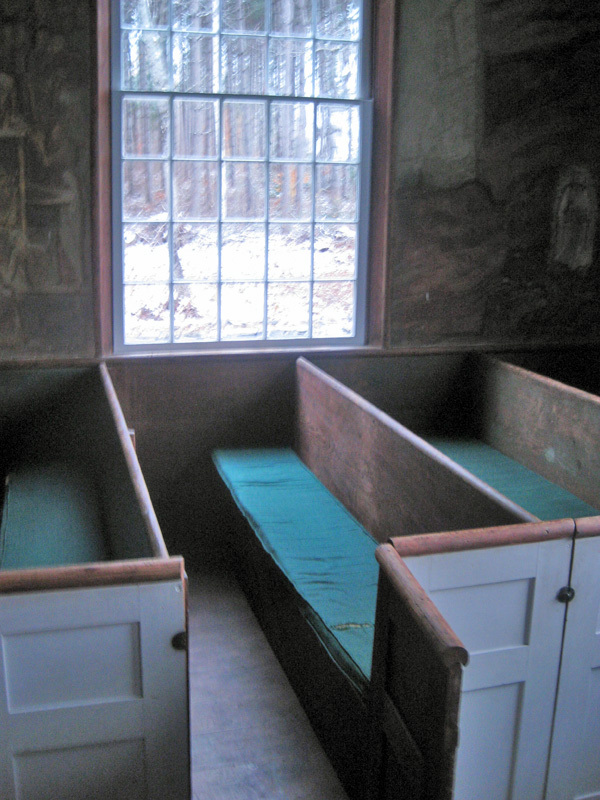 In 2007, a grant from the Maine Humanities Council supported the return of several of the artists, to discuss their work on the Meeting House. 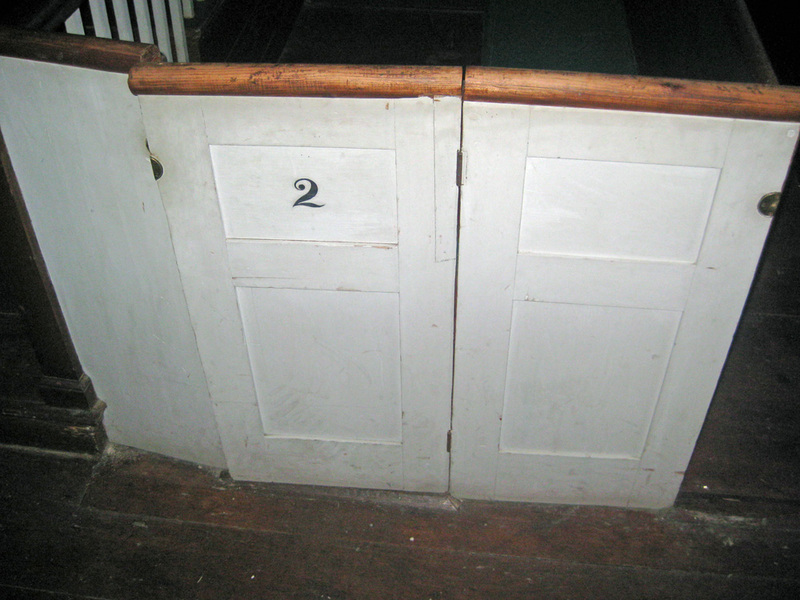 The South Solon Free Meeting House, never locked, is open year round. Heat is not an option. The Dilettante is indebted to an article by Lew Dietz, in Down East Magazine for Nov-Jan. 1957 for much of his information. Dilettante, thank you for this post. 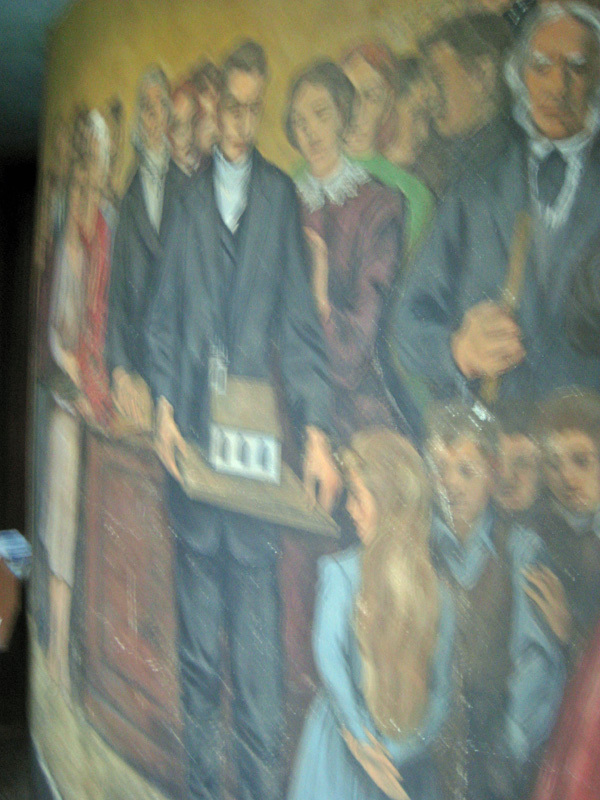 The murals are beautiful as is the meeting house itself. Near where I was born is (was?) 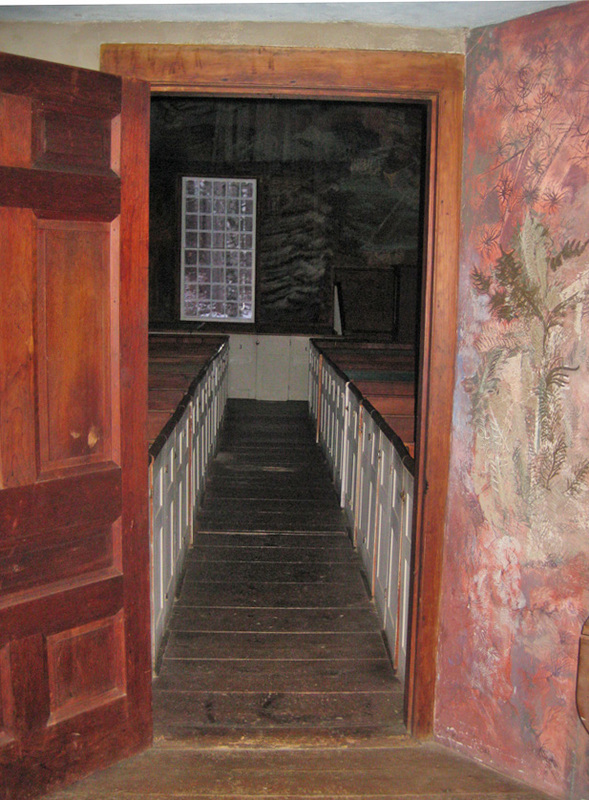 a quaker meeting house, perhaps one of the earliest, and it too had the feeling of a place of contemplation. That is quite possibly one of the most perfect buildings I have ever seen. Good things come to those who persevere (and to those who read their blogs). 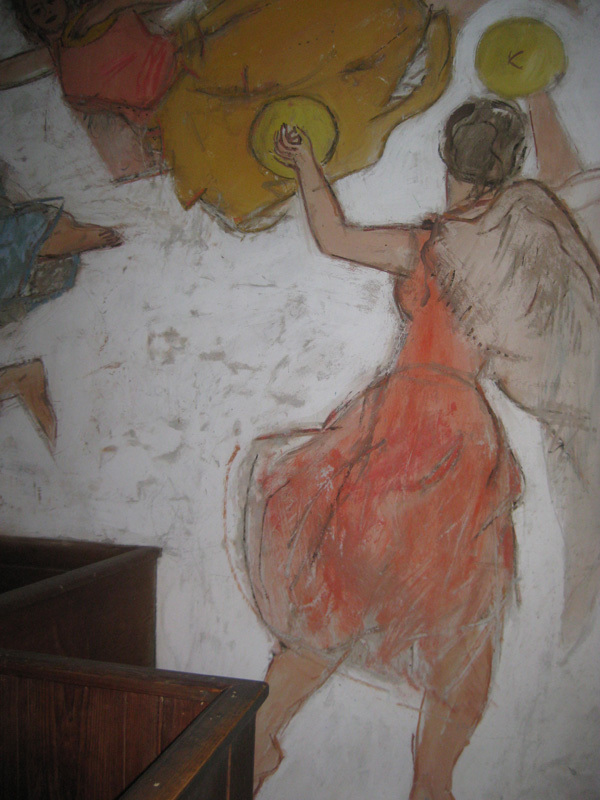 So do you think the frescoes are inspired or a desecration?Also, the ghosts were happy to have a visitor. 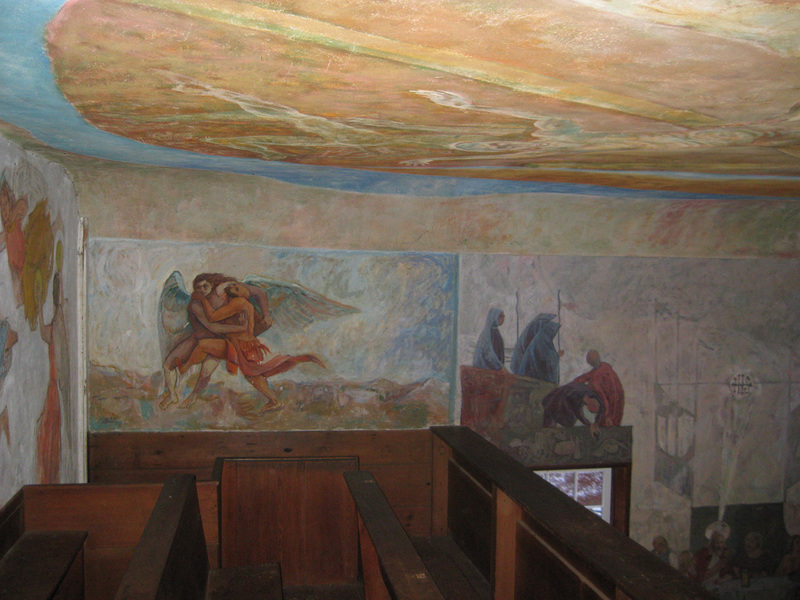 In what way or sense could these frescoes be considered a desecration? I recently read an unfortunate article in “Maine.’ magazine that overtly implied this as well. Thank you for sharing this. I find the way on how you've discovered it very interesting. I have been so interested with it that I'm planning to have it presented in class. I'd be glad to retold the story of this beautiful structure which I would be turning to a model using a portable CMM. Thanks again for sharing! Ohhh. I can't find words….thank you will have to do….I'd not seen pew doors before, doors that open/close adding yet another detail to the monumental scale of this intimate chapel. DED, you do such fine work, you give us so many riches. The combination of the murals, the building and the site are so amazing. Thank you for educating me with every post. I live in a lovely southern Maine tourist destination now and enjoy it but yearn for the “other Maine” and for people who understand it. I am so grateful for your insightful, discerning posts. It’s wonderful to read thoughtful work about the subtle beauty that is so near. Oh that is amazing! I of course would wish they would all be somewhat more..related or connected but it's sort of charming and naive that each wall seems discordant -much like the original simplicity of the church itself. Or is that my imagination? Is it more a whole in person? I always enjoy your diversions but really not sure what to make of these frescoes. They challenge my nostalgic desire for purity and simplicity in a building like this and I am often ambivalent about public art. It's looking a bit like I don't like them! 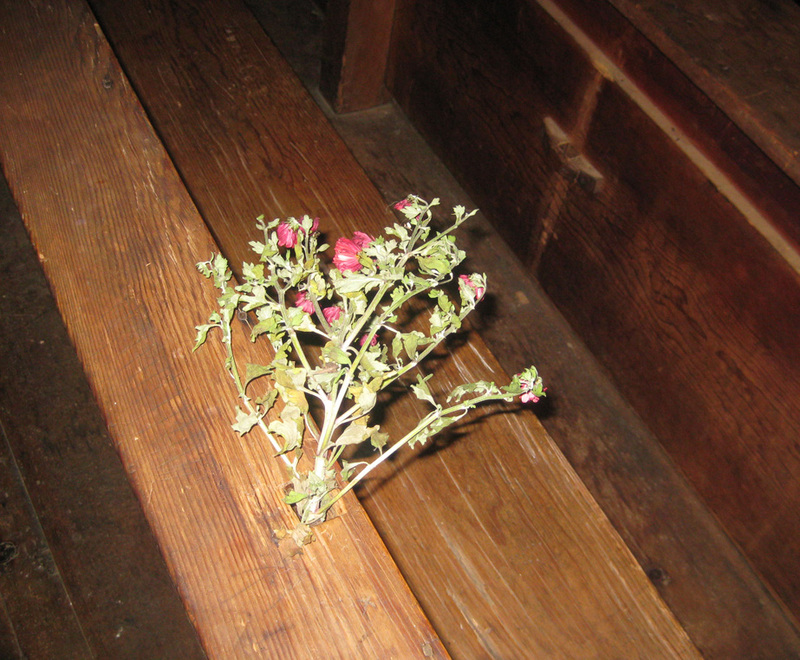 But I would want to be in the meeting house before making a final judgment. It's a curious dilemma to maintain a building…keeping it as the designers intended, or add some character (or quirk factor as I think of it in this case.) I wonder if its location (middle of nowhere) adds to our tolerance. I love the effect of the paintings in your photos…would dearly love to see this place. Thanks for a wonderful post! 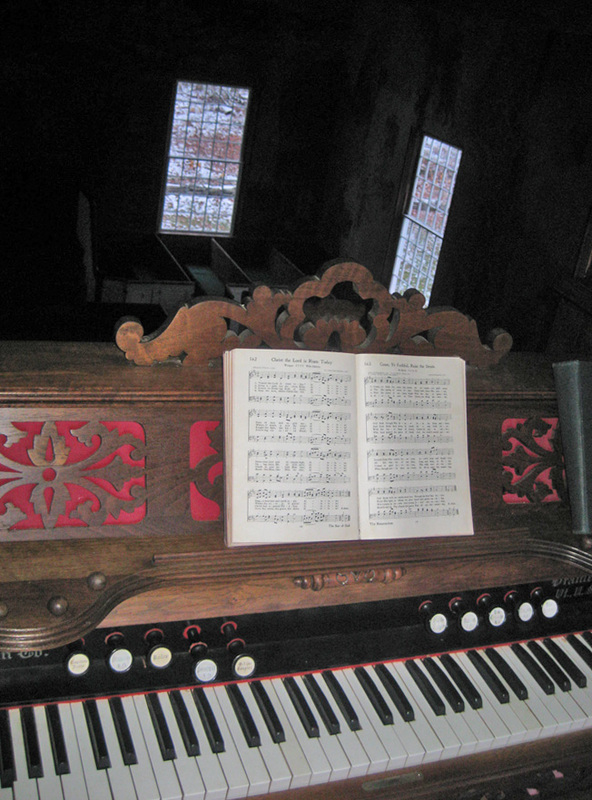 Thank you, Dilettante, for sharing the info and images on the South Solon Meeting House – a treasure indeed. I am so struck by the cultural likenesses between upstate Maine and my Nova Scotian environment. What a wonderful, wonderful post. Thank you for all the research and hard work. So very interesting and beautiful all at the same time. Keep it up! A post like this is why I am an avid follower of your blog. How can one read such a fascinating story if it weren't for your intrepid driving and research? What a thing to discover in such a rural location! So happy to read that it is being kept "alive" for future travelers to enjoy. Few things strike such wonder in the mind and heart these days. Thanks so much! You were right DED. I love this story!